We are relaxed and friendly, Come as you are, take a walk, taste some wine (and some grapes when they are available), play ball with Lucie and Olive and enjoy some old fashioned hospitality. View from Tasting Room: We have a beautiful view of the Napa Valley in all directions. We are surrounded by vineyards and tree covered hillsides. Wine Education: Our tastings are hosted by us, the owners, so we are able to answer all your questions about small winery operations and vineyard growing practices. Food Available: Cheese available on request, crackers a must and a beautiful picnic area for you to bring something if you would like to hang out. To join the wine club, visit www.varozzavineyards or call 707-287-5574. 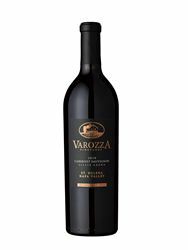 Varozza Vineyards is certified under the Napa Green Winery Program by the Napa County Department of Environmental Management (DEM) and the Association of Bay Area Government’s (ABAG) Green Business Program and completed all the regulatory components needed for environmental sustainability. These components included developing water and energy conservation methods, preventing pollution, and reducing solid waste. In addition to developing sustainable winery practices, this program is set to become the standard for the state of California. Varozza Vineyards is certified under the Napa Green Certified Land Program. Varozza Vineyards has created and implemented a customized farm plan with measured results that addressed all aspects of its property, vineyard land as well as non-farmed land, including practicing soil conservation, water conservation, stable drainage, riparian corridor enhancement, fisheries and wildlife habitat enhancement and long-term improvement and sustainability.